4A Fore Street is a deceptively spacious Grade II listed town centre maisonette with three double bedrooms, two bathrooms, a private south-facing decked garden and a parking space. Few properties in Totnes could lay claim to a more central location than 4A Fore Street, being situated right in the town centre. More than a maisonette, it is surprisingly more a house up a flight of stairs, the accommodation being set out over three floors. 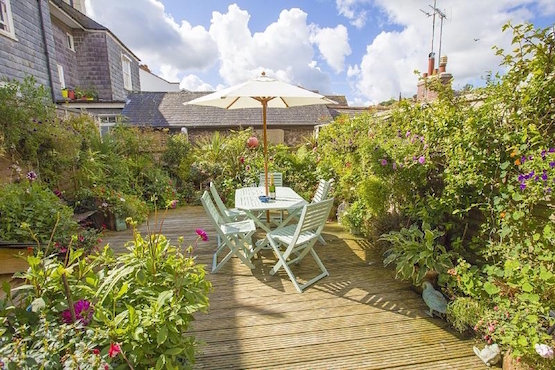 On the first floor there is a living room and a charming cottage kitchen/dining area with doors leading onto a fabulous private decked south-facing garden. On the second floor there are two spacious double bedrooms and a family bathroom. The third floor is a little getaway haven consisting of a double bedroom with fitted wardrobe space and a shower room. There is also a very useful separate office/study space. The property is well decorated throughout and enjoys lovely views over the rooftops to the countryside beyond. 4A Fore Street is for sale with a guide price of £295,000. If you would like further information or wish to arrange a viewing, please contact Marchand Petit’s Totnes office on 01803 847979.